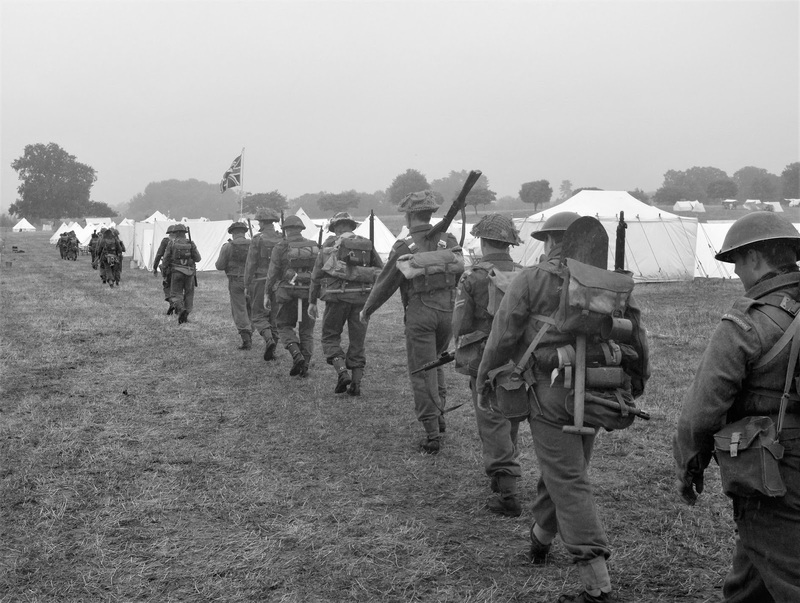 Welcome to the website of The East Yorkshire Regiment Living History Group No. 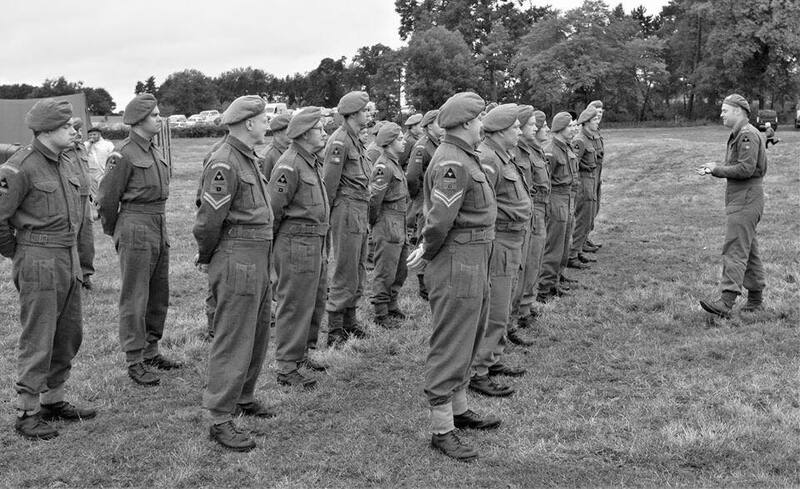 10 Platoon 'B' Company. Please have a look at the blog of our recent activities, our photos and much more! I packed on Wednesday night, collecting the 14 man tent (or 16 natives) from CPL Lycett’s house, this way me and PTE Heaton could get a quick get away on Friday evening. After arriving at Bodrhyddan Hall it was clear, that my guess of warmer weather down south was wrong, and in fact I’d rather be in Castleford. The tent went up super quick and beds put up in F1 timing. 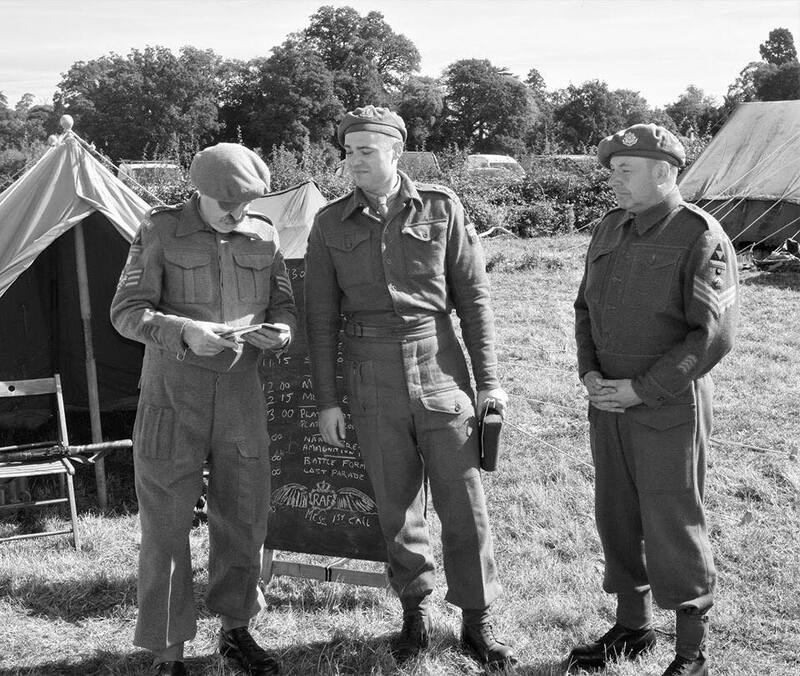 Me, PTEs Heaton & Pozniak, Colour SGT Hebden and ATS Mellor retired to the Radio tent for a warm and a beer, a bottle of port helped keep off the cold, it was VERY VERY cold and windy! Saturday was sunny but windy, with a morning frost, our camp set up on the far hillside was well attended, for a first event it had lots of public, PTEs Etherington, Wilson & Klejnow had arrived and helped set up our display. The 2pm Fire Display was short and sweet, PTE Heaton gave a short talk about our group and kit, then me and PTE Klejnow took the public through the Lee Enfield no.4 and Mk2 Sten, the blanks for which were kindly supplied by the organisers, this was a warm welcome from a new event, a number of the big events don't contribute to ammunition, it’s nice to know some event organisers appreciate us travelling and bringing original kit along for their events. Saturday evening after PTEs Pozniak, Etherington and Wilson had departed, we decided to go in to the local village for a beer and walk around, we visited the sea and found a pub for some food, at £8 a round though we decided to leave and find another pub, to my delight it was showing the Leeds United game...4 games left before promotion! We sat down and had a lovely meal together. Saturday night was warmer and beers around a fire were enjoyed, Sunday morning was much the same as Saturday...until the sun went away. Wind, wind and wind kept us cold all day, ATS Mellor’s lovely stew gave us some warmth at dinner time, and just after the firing display we packed up. One of the earliest pack downs we’ve done and quickest. By 4pm all of us had said goodbye and were back on the M62 north. A brilliant weekend!! So to the season finale and the East Yorks stormed Pickering Castle! (Not much to storm nowadays!) No A64 closures so traffic was normal for this weekend. Members arrived Friday afternoon and evening and bunks were set up in the Education Room then set off into an unseasonably mild but blustery night to sample a few beers. Lights out was around 12.30am and the heating and extra blankets weren’t needed. What a contrast to Friday night at Rufford! Saturday morning saw more arrivals and the camp was set up in the castle grounds. Weather was still mild but the wind became stronger and was to cause problematic for the tent later in the day. 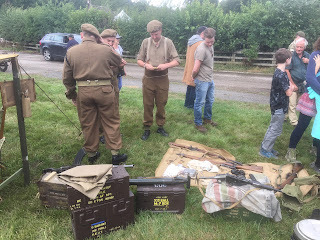 The training scenario was a section attack on a German bunker with pyros and plenty of blank-firing weapons with Pte Heaton giving his much detailed talk about the battalion, uniform, kit and weapons afterwards. 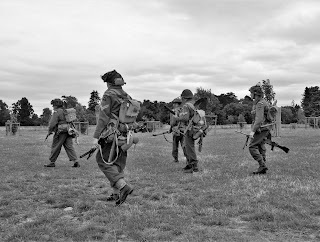 The windproof smocks came in useful to portray late 1944 infantry. There were around thirty viewers and most obviously knew what was happening turning up minutes before the start. Lunch came in the form of a delicious stew made with anything that needed using up! As we were lining up after the 2.30pm scenario the tent finally gave way to the wind so all hands were needed to erect it again. Saturday night was Col. Sgt. Hebden’s East Yorks stag night so members dressed in best BD’s and civilians with the Heatons attired as gangsters. Well, they are from Castleford! Didn’t turn out to be much of a stag night as we were all back at the billet by 11.00pm with rolls of unused cling film! Lightweights! Sunday turned out to be a miserable wet day with relentless rain. The scenarios were altered so no pyros or Bren team, and the talks were done in the Chapel. Visitors still turned up so the show must go on! Thanks to those who did brave the walk up to the Castle to see us. Again the same faces turned up as they have in previous years and the 9 year old had brought his mate this year. Because of the weather the English Heritage guys in the hut said we might as well pack up early so most were on their way home by 4.30pm, just as the clouds were breaking! Can’t really grumble as we have been very fortunate with the weather for quite a few years at Pickering. Still a great weekend though to chat and chuckle with friends. This year saw the groups return to Rufford since 2015. After a change of organisers it was decided that the group should attend an event that has been on the calendar for many years before. A lovely setting in the grounds of a 12th century abbey and later a 16th/17th centuries stately home. On arriving camping and exhibitors were lead to their destination at walking pace by a guy with a red flag or one playing a flute! Friday afternoon was T-shirt weather as tents were pitched but due to clear skies the temperature dropped and we had to wrap up well under the dining shelter then trekked over to the Rose Cottage for a pint or four. And now to Friday night/Saturday morning which will be talked about for years to come as it was ‘expletive’ freezing!! We awoke (or not for those who couldn’t sleep!) to frost but the sun soon warmed up and we were in shirt-sleeves. This year we had no commitments so time to chat and wander. 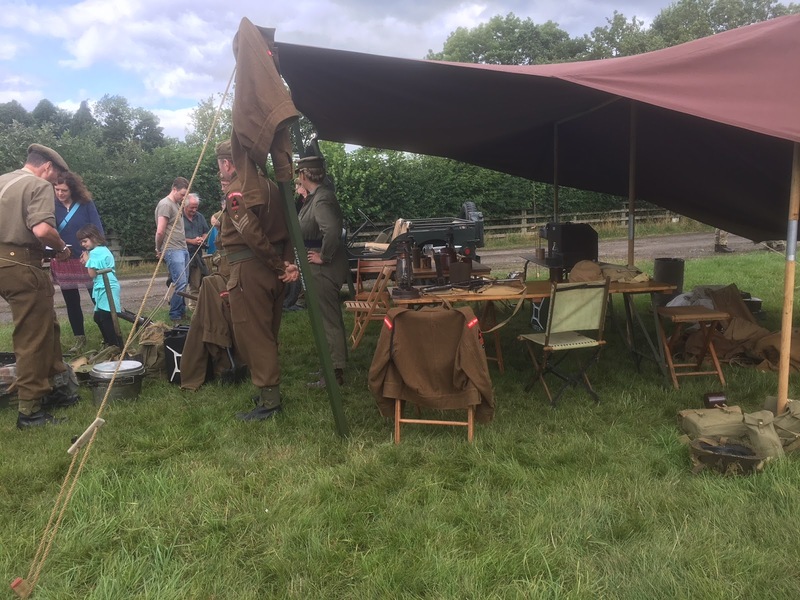 After more arrivals our numbers rose to eleven and as well as the usual dining shelter table-top display, there was Pte Pozniac’s radio set up (the typewriter a favourite with the kids! ), Pte Haycocks’s RAMC display and Pte Clewlow’s 1930' Ford hotrod proved popular. As with Friday the temperature dropped but still some of us hardy souls braved the trip to the Pub and the night proved to be not as cold as the previous. 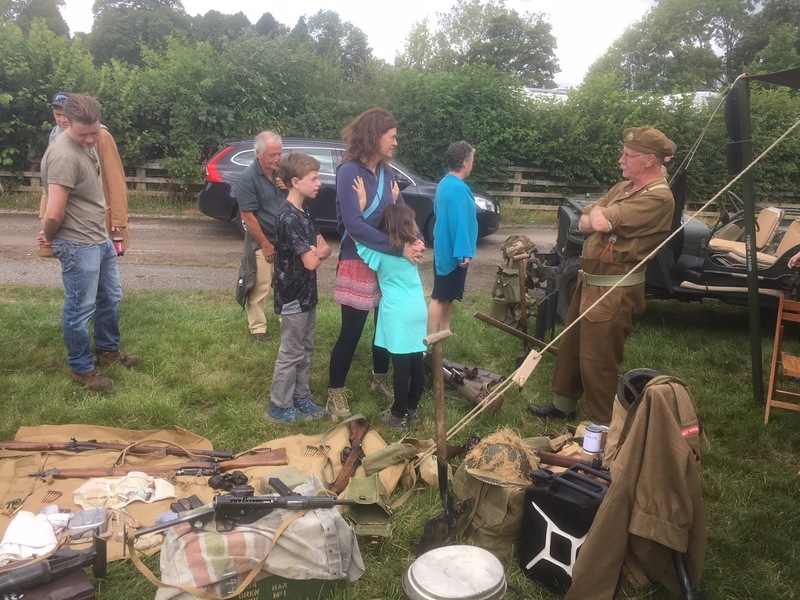 Sunday before long became a pleasant day, the crowds flocked in and our display was busy with interested visitors which included ex-services who had used some of the weapons on show. We also had an excellent view of the NFS scenario with the guy hosing the flames 50 feet up the extendable ladder. Wouldn’t get me up there! Rufford housed officers and its grounds were used by the Army during the War so a very appropriate setting and it’s hoped that it still has a future within the WW2 re-enactment calendar. We chose this event to be this year’s outing for our relatively new 3rd British Infantry Division Association. 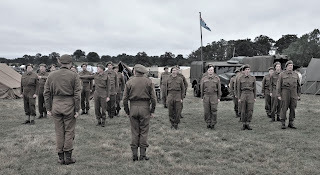 Made up of three individual WWII British Infantry re-enactment groups ( Suffolks, Warwicks & East Yorks regiments ) we had tried this out at the Victory Show last year where it had worked well so Adam and I were looking forward to seeing another successful outing for the combined group. Spetchley Park is a fine Georgian stately home and grounds in Worcestershire just off the M5 south of Birmingham. After an early start on the Friday evening we managed the trip from Castleford in two hours twenty minutes which appeared to be the shortest travel time for any of the attendees. Horror stories of delays and roadworks and traffic jams and one trip taking in excess of five hours suggested we had got off lightly. After getting beds set up in the 14 man tent we spent a pleasant evening under the dining shelter and later at the beer tent. The pop-up bar ‘The Wheatsheaf’ was there again giving a representation of what the inside of a period boozer would have looked like. 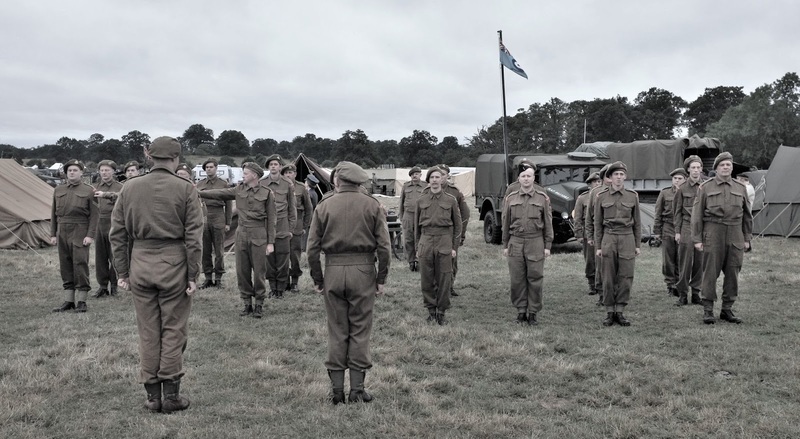 This event is a multi-period event and covers re-enactors from the ancient Greeks all the way up to WWII with just about everything in between. This year they even had a group re-enacting the Texas Revolution of 1835/6. I have not seen that re-enacted before. For those not in the know this was a rebellion of colonists from the United States who joined forces with Texas Mexicans to take up armed resistance against the Mexican Government (Remember the Alamo!). It ended with Texas becoming independent from Mexico and then later Texas applying for and being granted permission to join the Union of the United States of America. Anyway, history lesson over now. What I was trying to say is that it is an event which literally has something for everybody. In view of the event taking part in the landscaped grounds of the house, we were not allowed to dig in and show ‘troops in the field’ as our display. Instead, we depicted a tent city of troops in lockdown in holding camps prior to embarkation for Operation Overlord. It worked – a tent city it was indeed. We even had a medical aid section and the ATS working to fix a problem with the transfer box of a Jeep. Saturday morning was intense. Parades, introductions, rifle drill and square bashing started the morning off. With the numbers from three different groups, we had more than a full strength Platoon including an Officer and appropriate NCOs. I could tell that this was going to be a good weekend. The morning finished with the groups splitting into separate sections and repeatedly practising the left/right flanking movements. This was time well spent and paid massive dividends later. After lunch, we were given some time to ourselves to look around and see the other re-enactments/mock battles ours being last of the afternoon and scheduled as a ‘skirmish’. Seeing thirty plus WWII Tommies in full battle order is not something you see often and we received many comments of approval from the audience as we moved into place ready for the skirmish to begin. I thought it was probably going to be a bit one sided as there were only about twelve German Fallschirmjagers against us. As to how the skirmish went, well I can’t tell you from a first-hand account. 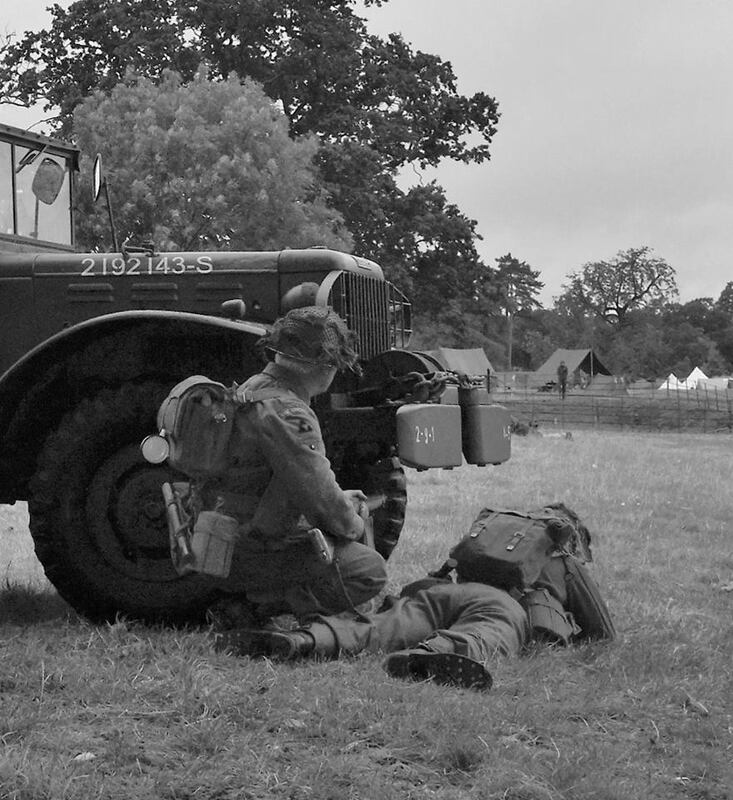 I guess it was like that back in 1944 as each individual soldier only saw his little bit of something much bigger. It seemed to go well to me and I had seen the other sections moving independently under the control of the Officer. Then, after the action was over and we lined up at the crowd line for safety checks and to receive applause, the commentator on the public address system could not contain himself and went wild with appreciation. Shortly after when we joined in with the final parade of all the re-enactors we had many complimentary and appreciative comments at what we had done. With the public departing as the afternoon concluded the rain clouds gathered and it turned rather wet. Adam and I had intended to put best kit on to go the Beer tents. Not wanting to have to spend the following day in a damp heavy woollen serge battledress, we changed into modern (comfortable) kit. This was a wise move. Across the evening we again received many appreciative comments regarding our skirmish. 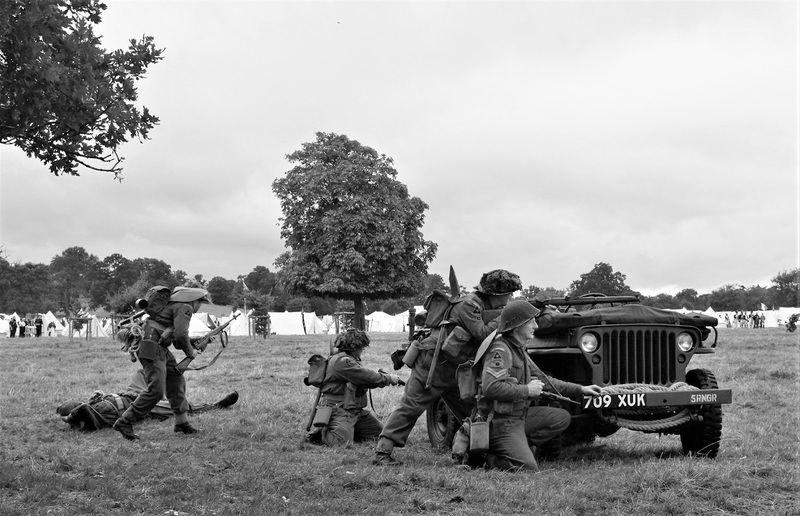 Somebody commented that it was the best WWII battle the event had ever seen to the point that we didn’t look like re-enactors. No, we looked like real soldiers. Sunday morning started dull but brightened as it went on. After a spot of square bashing, we had a walk through how a platoon attack works with the three sections moving independently to support each other. Now I could understand how and why the public, the other re-enactors and the commentator were so impressed. 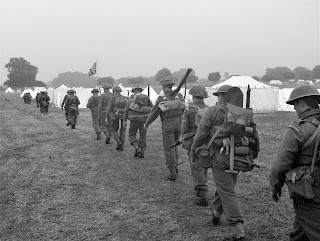 The Sunday skirmish came a little earlier and started off with us being caught in a cloudburst as we formed up, just to make it unpleasant. However, this had blown over by the time the skirmish started. Lessons had been learned from the previous day. Adjustments were made to the shape and the events of the skirmish. Again it went well to me but this time the commentator was even more excited and enthusiastic saying it was even better than the previous day! 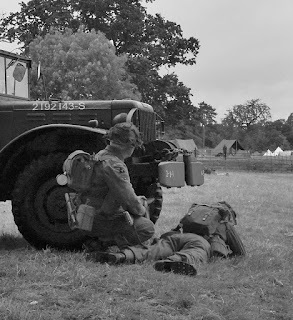 After another final parade of all the re-enactors, it was time to pack up. After saying fair well to all our chums both old and new Adam and I set off home at about 5.20pm. An early departure helped by the fact that some were staying another night and so the tents and other facilities did not need to be taken down and packed. Again it was about two hours and twenty minutes home and after swiftly unpacking we paid a trip to the pub for a final beer before bed where we talked and talked about how good the weekend had been. This was indeed a very successful weekend and has again proved the concept for combining groups to form a Divisional Unit. I think it is the future for WWII British Infantry re-enacting and understand plans are already in hand for similar events next year. I can’t wait! Article by: PTE Dale Heaton. When I set off for Pateley Bridge the weather was hot and sticky. I made the 30-mile drive in good time but the sky was looking increasingly dark and heavy. The rain persisted for the rest of the evening. Anna the girls and I stayed at the camp while the rest ventured into Pateley to sample the local beer and food. It was beginning to get chilly sitting under the dining shelter so an early bed, but not to sleep. I was woken at regular intervals by the torrential rain battering the tent. It was so loud that I couldn’t hear Christine trying to speak. I have spent many rainy nights under canvas over the years but I have never heard anything like this. You couldn’t even hear the Sarge snoring. It was still raining at daybreak so Anna and the girls decided to break camp and go home. While they were getting organised I breakfasted and got into kit. Slowly the clouds began to clear and eventually the sun showed its face. We got the display sorted out and we were joined by Tim Shellcock and Chris Dennington. The public soon started to arrive and we had a busy day chatting and explaining the various bits of kit. The organisers provided meal tokens and a detail was sent off to gather the supplies. It was just a sandwich and a bag of crisps but more than most organises bother to provide. About 3.30 p.m. it began to cloud over and soon it was raining heavily. This stopped the flow of public and soon we were just standing in the rain chatting to each other. We got the display undercover and Chris and Tim set off for their respective homes. Once again a small party headed out for the highlights of a wet evening in Pateley Bridge. It quickly got cold and I made an early retreat to the warmth of the relatively dry tent. Saturday night was much the same a Friday and again it was still raining at daybreak. Adam and Dale made an early departure. We breakfasted and waited for the weather to lift. After a while it became clear that the weather was set in for the day and there were no public about, so we reluctantly decided to call it a day. We then set about dismantling the camp but still leaving something to shelter under. We got the big tent down and I had to put the jeep under the dining shelter to load it and then get the canvas upon the jeep. All my kit was put in the radio tent and then the dining shelter was taken down. I had earlier let Anna know we were calling it a day and we only had a short wait in the rain before she turned up. We soon had the car loaded and then got the radio tent down and thrown on top of the big tent in the back of the jeep. I bet we look a right sorry sight. Goodbyes were quickly said and we were soon heading for home. A good little show spoilt by the sudden return of the British weather. 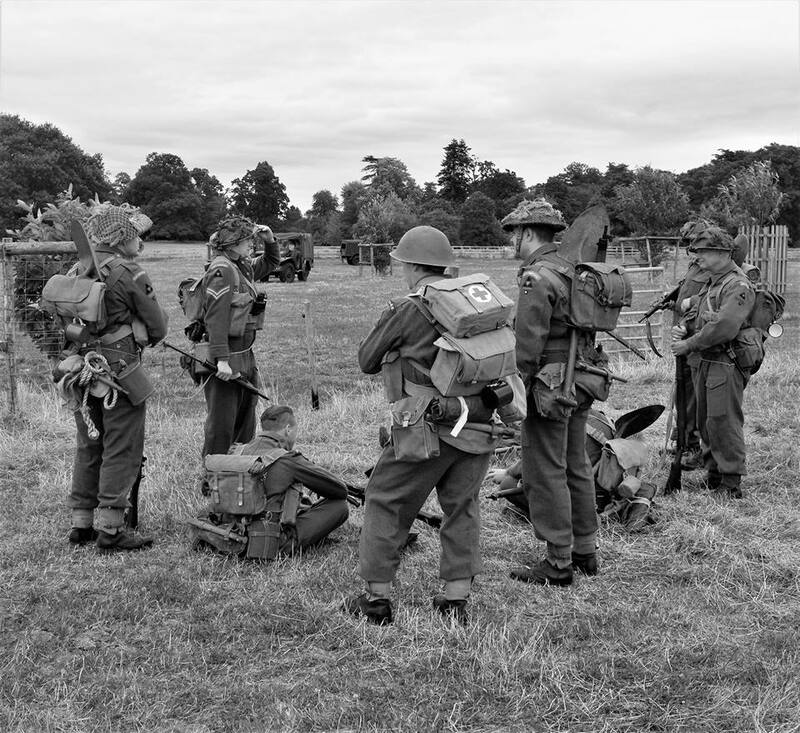 The East Yorkshire Regiment Living History Group is a member of the National Association of Re-enactment Societies (NAReS). Photos displayed here are by members of the group unless otherwise stated. If you wish to use any of these photos please ask for permission as usual copyright applies. To view large versions of photos on our website simply click on them.